From the Mass. Pike/I-90: Take Exit 2, then Route 20 North (about 14 miles). Rte. 20 merges with Route 7 and is also known as South Street. Continue north into downtown Pittsfield. In the center the road becomes North Street. Continue north through the downtown about 1.5 miles to the intersection with Pontoosuc Avenue. Take a left onto Pontoosuc Avenue. Go about 0.25 miles and cross Wahconah Street. You will now be on Pecks Road. 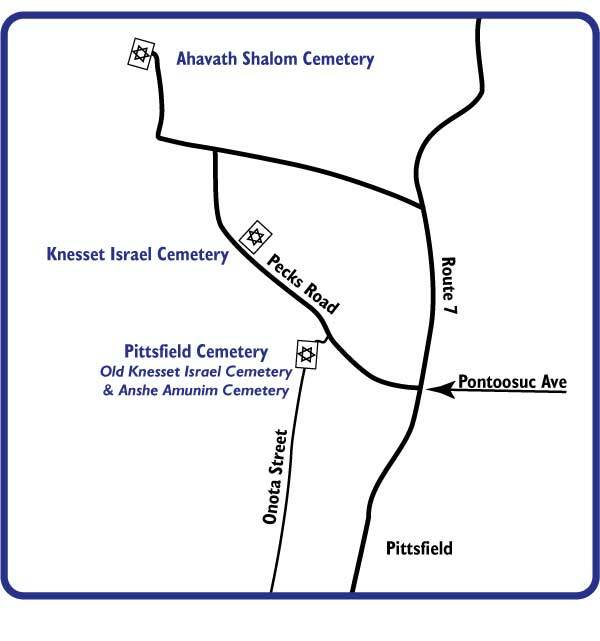 Still further on Pecks Road (about 3/4 mile), turn left onto Hancock Road and go about a half mile, then right on Churchill Street for about a half mil and the Ahavath Sholom Cemetery will be on the left.